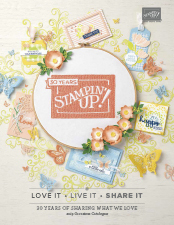 Today I share with you another sneak peek of a product in the new Annual Catalogue which starts tomorrow!!! YAY!!!! 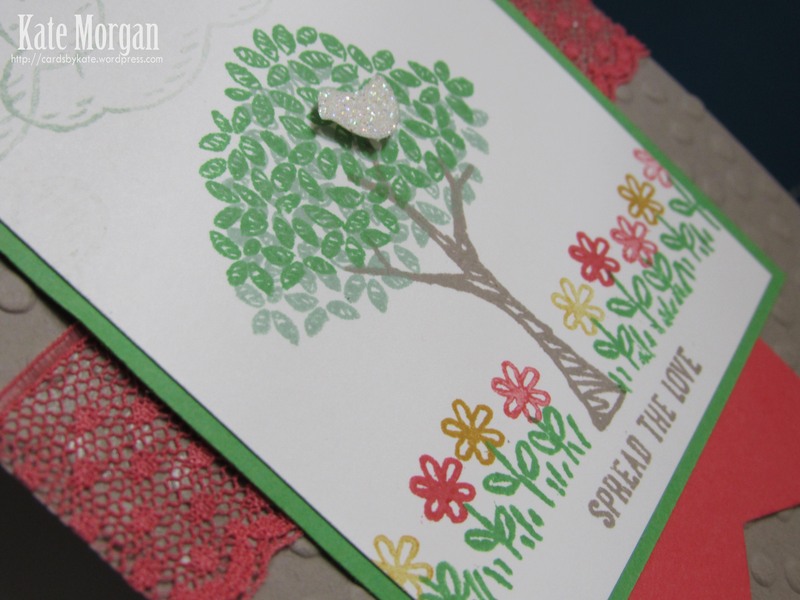 This stamp set is called Sprinkles of Life, but yes, I have used it in a different way to the card I showed you last Wednesday. If you missed it, you can view it here. This set is so versatile, you will see why in a minute. 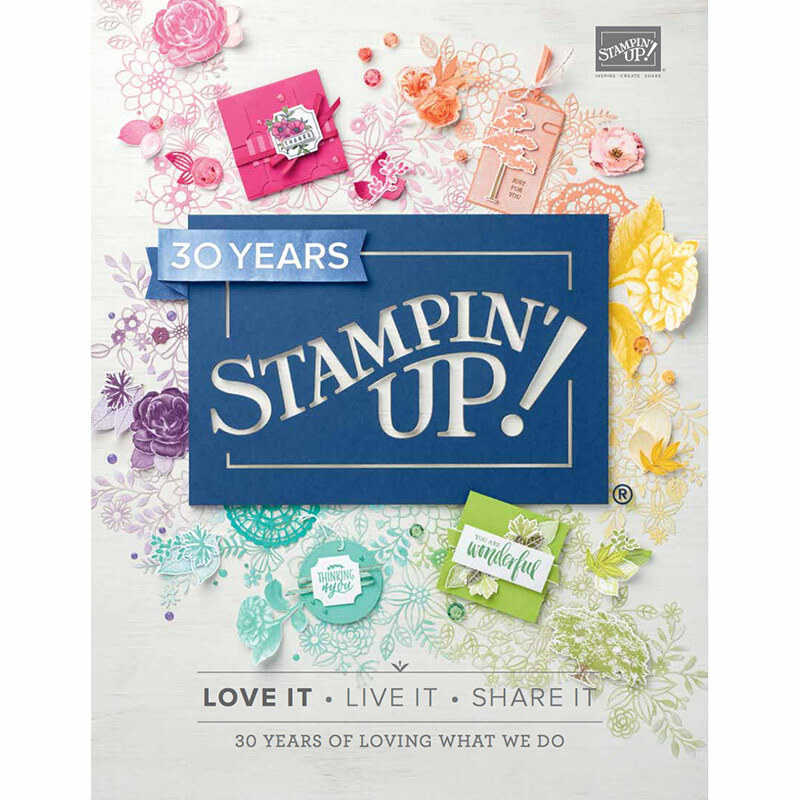 This stamp set is photopolymer, so it is completely clear so you can stamp exactly where you want without using the Stamp-a-ma-jig! The base card is Tip Top Taupe with a layer of the gorgeous new lace ribbon in Watermelon Wonder and a banner in the same colour. Then a layer of Cucumber Crush and Whisper White on top. I stamped the clouds in Mint Macaron, along with the leaves on the tree top. There is also a layer of Cucumber Crush leaves on the tree, and the trunk is Tip Top Taupe. I have managed to use all of the brand new 2015-2017 In Colours on this card, the last colour being Delightful Dijon in the flowers! As previously mentioned in my previous post, the Tree Punch coordinates with this stamp set and that is how the little silver glitter bird was cut. Don’t forget that the Retired Product List is still available until tomorrow, so click here to shop online 24/7! I also want to remind you that the end date for the 2014-2015 annual catalogue is tomorrow, 2 June! The brand new catalogue starts tomorrow, so there is 1 day cross-over for both catalogues. This hasn’t happened before, so make the most of the extra Hostess Benefits. Next postToday only, you can have it all!